"WHAT'S THE MUSIC IN THE INTERLUDES?" In this video I show you my favorite rootles chord voicings for V7, maj 7 and min 7 chords. And I'll show you how you can use these to play ii - V - I's with Tritone Substitution applied to the V chord. Notice that the major 7 and minor 7 voicings play 3 5 7 9 in the right hand, whereas the V7 chord I play 3 6 7 9 instead (6 or '13' instead of 5). This is because the 13th sounds more colorful and works better for the V7 chord. And it also helps keep the voice leading smooth when you play a ii-V-I, with each chord change you get a nice step wise movement in the inner voices. If you enjoy this video I'd really appreciate a 'thumbs up' or if you could share it with a friend. 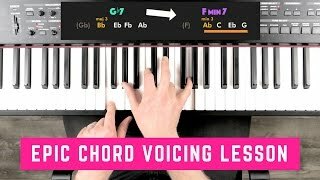 And I hope to see you in PART 2 of this video, where we'll go into COMPLETE ii-V-I's and ALTERED CHORD variations too!